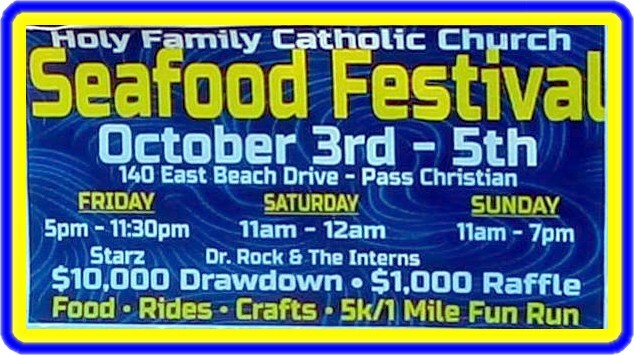 The Seafood Festival is a tradition that has become an annual affair for many. Good food and music have drawn huge crowds to the festival year after year. 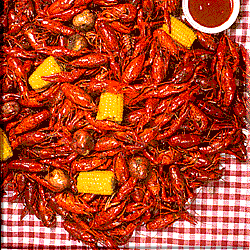 The first St. Paul's Seafood Festival was held in 1977, when festival co-chairmen Sam Amarto and Russell Ringer declared that seafood would be served at War Memorial Park for three days. Scenic Drive was closed to traffic and there were softball tournaments, cast net throwing contests, --- and eating and dancing in the streets. There were crafts, ample food and treats, and entertainment. By 1983, it was getting so popular, that a 5K run and 1 mile walk were added. In 1985, in celebration of the opening of the Seafood Festival, balloons were released accompanied by the "firing" of two cannons. In 1991, the festival was moved back to the school grounds. In 1992, the event received national attention by being listed in the World Book Encyclopedia. The festival is not just for fun. Proceeds benefit Holy Family Catholic Elementary School. This festival, as well as the annual Mardi Gras fund-raising push, allows the school to maintain a low tuition.